The Dogrib (Tlicho) people are one of the five major aboriginal groups of Northern Dene resident in Canada's Northwest Territories. Traditional Dogrib territory lay between the north shore of Great Slave Lake and Great Bear Lake (62-65° N, 110-124° W) in Subarctic forest. On August 25, 2003, the Tlicho (formerly Dogrib First Nation) signed a land claims agreement with the Canadian federal government. The agreement ceded a 39,000 km2 area (including both of Canada's diamond mines) between Great Bear Lake and Great Slave Lake in the Northwest Territories to Tlicho ownership. A historic vote held by members of the former Dogrib Treaty 11 (current band members and descendants of Treaty residents) ratified the "Tlicho Agreement," a far-reaching self-government document that recognized the rights and lands of the Tlicho people and established an official Tlicho government. The Dogrib (Tlicho) are one of several First Nations party to Canada's Treaty 11, which attempted to ensure Crown control of resource extraction and development all along the Mackenzie River valley. The Dogrib (Tlicho) speak one of several northern Athapaskan languages. These are spoken not only by the Dene of the Northwest Territories but also by those in Yukon, Canada, in Alaska, in northern British Columbia, Saskatchewan, and Manitoba. Southern Athapaskan speakers (Dinee) include the Navajo and Apache peoples of the southwestern United States. The language family distribution gives rise to an as yet unsolved question about the origin of the Athapaskan speakers and the migration routes that led them to their historic and present distribution. The name Tlicho (formerly Dogrib) probably did not originate with the Tlicho themselves, although it is now the name they use for themselves when contrasting their group with other Dene. Dogrib or dogside may have come from the Cree First Nation to the south. During early historic times, variants of dogrib in the Cree language, in English, and in French referred to Dene living between Great Slave Lake and Great Bear Lake. The historical record is not clear, however, on when the term applied to the Tlicho so identified today; it sometimes included either the Denesonline (Chipewyan Dene) or the Deh Gah Got'ine and Shihta Got'ine (Slavey). By about 1700, however, English historical accounts refer separately to the Tlicho (Dogrib) and the Denesonline (Chipewyans). Spruce, poplar, and birch stands are dense in the western Dogrib (Tlicho) range. To the east, Tlicho land is thin forest amid Precambrian granite rock out-croppings, with many lakes and rivers. Fish are a dietary mainstay, along with caribou and moose. Even before the fur trade, Tlicho and other Dene hunted, fished, and snared all available species, commonly muskrat, beaver, hare, marten, lynx, and wolverine. Gill nets were set throughout the open water season and again as soon as the ice was thick enough to hold people in early winter. 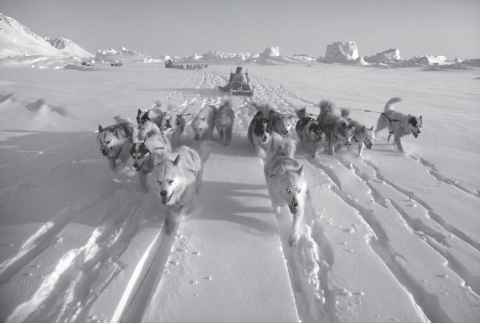 Fish were of course essential to feed dog sledge teams, the primary means for winter transport. Tlicho also traveled on snowshoes, and in summer by birch-bark canoe. The arrival of Euro-Canadian fur traders caused the Tlicho to alter their seasonal round to include trapping seasons, with delivery and sale of furs at the trading forts. However, Tlicho maintained their traditional hunting and trapping nomadic lifestyle well into the 1950s. Today few people trap, but most hunt, fish, and gather berries as well as hold wage employment. Indigenous foods remain essential in Tlicho communities. Tlicho territory is surrounded by other Dene: Denesonline and T'atsaot'ine (Chipewyan and Yellowknives) to the south and east; Deh Ga Got'ine and Shihta Got'ine to the west; and K'ashot'ine (Hareskin) and Dinjii Zhuh (Gwich'in or Kutchin) to the north. Along with other northern Dene in Canada, Tlicho settled in this area perhaps 30,000 or more years ago. The archaeological record shows development of technology, subsistence, and settlement patterns from about 8000 years ago, which are virtually the same as that of the Dene whom European explorers and traders first encountered. Archaeologists consider the prehistoric Taltheilei Shale tradition to be ancestral to the Denesonline, but have not identified prehistoric antecedents specific to the Tlicho. Today the Dogrib (Tlicho) who remain in their traditional territory live mostly in the small communities of Gameti (Rae Lakes, population 290), Wha ti (Lac la Martre, population 480), Wekweti (Snare Lake, population 138), and Behchoko (Rae-Edzo, population 1850). Many urban Tlicho reside in Yellowknife, the capital of the Northwest Territories (total population 17,702: total native population 4128 and nonnative population 13,574; figures from the Government of the Northwest Territories Bureau of Statistics). Those who attend postsecondary school primarily reside in Fort Smith, Northwest Territories, or in Edmonton, Alberta, the nearest city to Tlicho territory. Contemporary Dene, having worked with elders for several years to record and teach Dene knowledge and culture, organize Dene knowledge into four areas: the spiritual world, the land, the people, and the self, all of which are intimately connected. The spiritual world includes living forces in the land and water as well as medicine power. All creatures and things embody spiritual qualities and characteristics as evinced in legends, water and ice, animals, northern lights, heavenly bodies, and the drum. The drum is a moose hide-covered circular frame with two strings stretched parallel across its surface. The drummer holds the drum by the strings on the hollow, or back, side of the frame with one hand, his beater in the other hand. The drum is said to represent the unity of the self, others, the spiritual world, and the land. Dene Elder George Blondin stated, "The old people tell me that the Creator gave our people medicine powers to help them survive the hardships of living. It was part of religion. All people did not have the same kind of powers. Some individuals had very strong medicine power; and to some a Drum Song was given. It's known that three or four of these special people existed in every tribe. Our people had some songs just for fun and dancing, but the sacred Drum Songs were used for praying, for healing, for seeing into the future" (Blondin, 1990). Dene laws govern the way people are to behave in relation to the environment and to others. People depend on the land and its creatures in order to survive; thus, people must maintain an attitude of humility toward all things in nature. Dene laws—of which Dogrib (Tlicho) have formed a part—include both prescriptions and proscriptions for the proper treatment of animals to ensure that the animals will continue to submit to the people and therefore support their survival. Women and men each follow rules regarding different animals and the equipment required for hunting and processing. During menses, women are restricted from certain activities. A Dene individual may have specific rules related to a particular species. Sehoti ("my people") is the Dogrib term for one's relatives. The term can also mean one's larger grouping, that is, the hunting band or group one traveled with or, presently, one's settled community. Although neither clans nor other descent groups were part of Tlicho kinship, extended family groupings remain strong within Dene communities even today. Siblings, their spouses, parents, and children frequently travel and camp together; the men of the group hunt together and meat is shared among the extended family. Tlicho identified seven regional bands within the First Nation throughout much of the 20th century. The regional bands represented one group with flexible membership. Most of its members spent a significant part of the year within a recognized territory for subsistence activity. Such bands were not necessarily together much or all of the time, but within bands sets of families formed short-term groupings according to the subsistence or fur trade needs of the season. Each band, and the family groups within it, was associated with a particular area within Tlicho territory, taking names such as Ta ga hoti ("Follow the Shore People") and Wulede hoti ("Connie River People"). Prior to the exigencies of dealing with Euro-Canadian treaty parties, neither the Tlicho nor other Northwest Territories Dene participated in any overarching tribal or band political organization. The role of a leader is to guide, not exert power over, others. The elders, women and men, guide and question the community. The underlying principle is that all people are one and the circle must not break, although reaching consensus requires much patience and struggle. In his essential history of Treaties 8 and 11, Rene Fumoleau wrote: "Traditionally the Mackenzie River Indians lived under the guidance of men who had earned respect by reason of their superiority in medicine (medicine power) wisdom or hunting. Official leadership was almost nonexistent. The power of decision was vested in the total membership of the group or band, and unanimous consent was required before action was taken: the chief was but a spokesman for his fellows" (Fumoleau, 1974). Fumoleau's description rests on Samuel Hearne's from as early as 1777, in which he wrote, "Europeans...being utterly unacquainted with the manners and customs of the Indians, have conceived so high an opinion of those leaders, and their authority, as to imagine that all who accompany them on those occasions are entirely devoted to their service and command all the year; but this is so far from being the case, that the authority of those great men, when absent from the Company's Factory, never extends beyond their own family" (Hearne, 1911). Today, Dene Kede, the school curriculum developed by Dene elders, teaches students that traditional leaders were the best hunters and providers. Leaders became leaders by demonstrating their competence and knowledge as well as by listening to the people and understanding their needs. The recent history of the Tlicho, and their present standing among Northwest Territories Dene First Nations, stems from events that occurred about 200 years ago. During the late 18th century, Tlicho came into conflict with the T'atsaot'ine (Yellowknives), who pushed them out of areas that the Dogrib were accustomed to exploiting. Tlicho oral history vividly documents the aggression of Akaitcho, the T'atsaot'ine leader, throughout the early 19th century. The Dogrib (Tlicho) leader Edzo succeeded in making peace with Akaitcho around 1823. Despite Dene oral accounts of a peaceful resolution, European accounts of this peace credit European negotiators. Current maps show Boundary Creek, the point at which their lands divided, midway between modern Yellowknife and Behchoko (Rae-Edzo). However, the conflict continues today while the Tlicho and Akaitcho's people negotiate the boundaries of their modern treaties with Canada. In 1921, at Fort Providence, the Dogrib (Tlicho) signed Treaty 11 with Canada. The arrangements apparently agreed to in Treaty 11, however, were either misunderstood or never completed, and thus the Tlicho are one of five Northwest Territories Dene groups who have either accepted a comprehensive land claim settlement (what the Canadian government calls a "modern treaty") or are in the process of negotiating a comprehensive claim or the fulfillment of outstanding treaty promises. Throughout the 20th century, Tlicho faced sustained pressure from government and industry through natural resource development such as gold and uranium mining and hydroelectric projects. Recently, the Tlicho have become partners with resource developers and are receiving some direct financial benefit from modern uses of their land.